"This recipe combines spices and flavors from the Mexican roasted pork dish, Cochinita Pibil, with Italian stuffed shells. 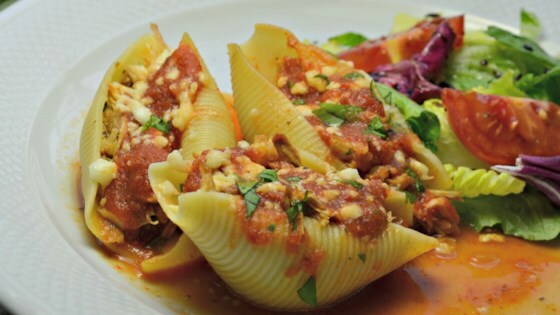 Seasoned pork, cilantro, and queso fresco give the stuffed shells a Latin-American flair that deliciously mixes things up." Sprinkle sazon seasoning over pork cubes and toss to coat evenly. Transfer to a large zip-top plastic bag. Mix orange juice, lemon juice, lime juice, cumin, paprika, chili powder, coriander, salt, and pepper together in a mixing bowl. Pour into plastic bag with pork; gently squeeze to evenly distribute marinade. Seal bag and place on a plate. Refrigerate 8 hours or overnight. Remove pork from marinade; reserve marinade. Heat oil in large skillet or Dutch oven over medium-high heat. Cook and stir pork until brown on all sides, 3 to 5 minutes. Add reserved marinade and enough chicken stock to barely cover the pork. Bring to a boil over high heat; cover, reduce heat to low and simmer 30 minutes. Remove lid and continue to simmer until meat is falling-apart tender, about 45 minutes. Transfer pork with a slotted spoon to a bowl; reserve 1/3 cup of cooking liquid. Cool pork slightly; shred pork with two forks. Mix in reserved cooking liquid, cilantro, and 7 ounces of crumbled queso fresco cheese. Bring a large pot of lightly salted water to a boil. Cook pasta shells in the boiling water, stirring occasionally until tender yet firm to the bite, about 13 minutes. Drain. Cover the bottom of a 9x13-inch baking dish with 2 cups of pasta sauce. Stuff shells with a spoonful of pork mixture and arrange in baking dish. Pour remaining pasta sauce evenly over stuffed shells and sprinkle with remaining crumbled queso fresco. Cover with aluminum foil and bake in preheated oven until hot and bubbly, about 30 minutes. Let stand 10 minutes before serving. Mushrooms, Italian sausage, and elbow pasta make a hearty, satisfying soup. To make your own sazon seasoning, mix 1/2 teaspoon each of ground coriander, ground cumin, ground annatto seeds (or turmeric), garlic powder, and kosher salt, plus 1/3 teaspoon oregano, and 1/4 teaspoon ground black pepper.